The safety of your customers and guests should be of paramount importance. 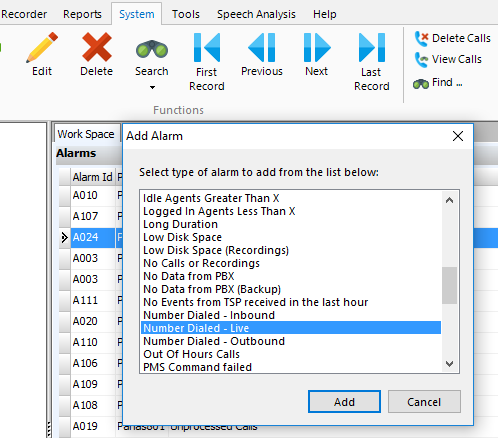 The “Office Solutions ™” range of applications (excluding Intro) have a feature called ‘Number Dialled Live Alarms’ which will monitor the telephone system and send an alarm as soon as a number is dialed that is set within a table, i.e. 999, 112 or other emergency number. As soon as the number is dialed and connects, an alarm is raised. IMPORTANT : The Number Dialled – Live Alarm is only available on Xpress, Pro, Compact, Ultimate and FrontDesk. It is not available on the Office Intro. Alarm can be raise when the call is in progress. “Emergency Call” or “Number Dialled – Outbound” are only raised after the call ends and is processed by the call logging service. 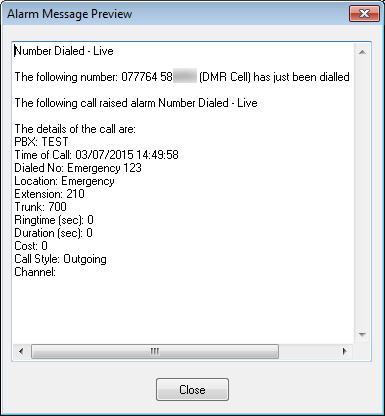 The “Number Dialled – Live Alarm” can also set a message on another phone. 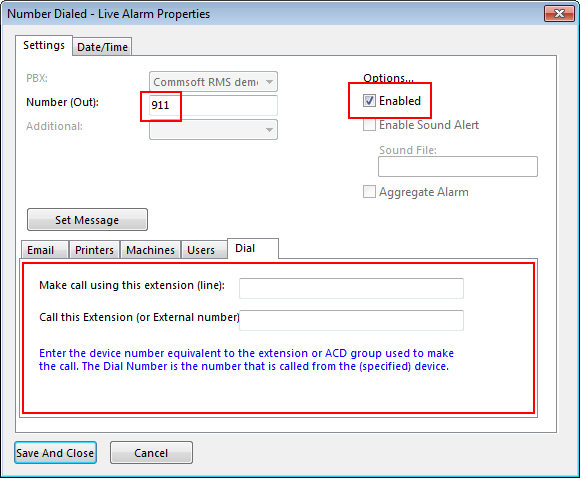 The “Number Dialled – Live Alarm” can also dial another number if configured. 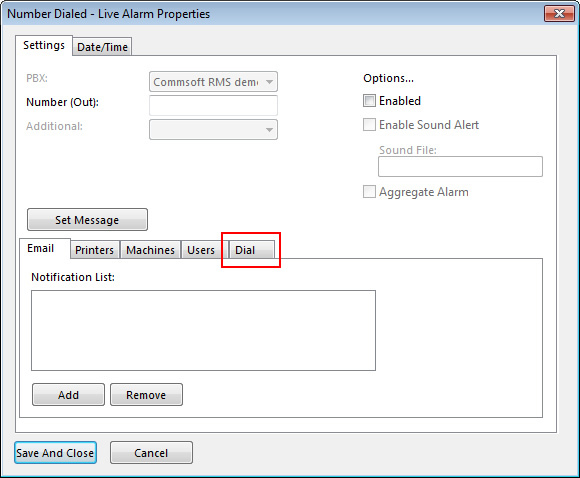 Click on the Green Add symbol to create the alarm and select ‘Number Dialed – Live‘ from the options. Enter the number to match in the Number (out) field and you also need to enable the alarm by selecting Enabled. In the screenshot below, 911 has been entered in order to send a live alarm if anyone dials 911. In the example shown below, the alarm is set to trigger if 07764 58XXXX is dialed (rather than 911 as shown above) from any phone on the telephone system. With the configuration shown below the Office Solutions CTI server will make a call from extension 2412 and will dial the target extension 2004 (an ICD/ACD group number may be used to ring more than one extension if required). If you wanted the program to dial an external number, you would enter it into the 2nd field Call this Extension or External number entering the number as you would manually dial it from the telephone. 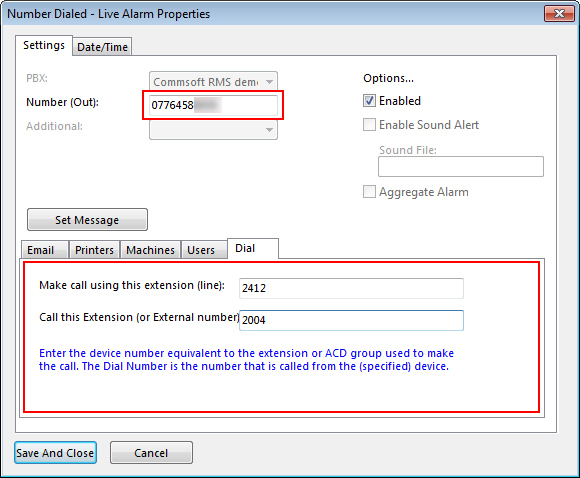 As soon as the call to 07764 58XXXX connects, extension 2004 starts to ring and an alarm message will be displayed on the display (proprietary extension telephone, note a display telephone is required for message to display). This alerts the user that the Emergency Number has been dialled. In most scenarios this would be 911, 999, 112 or whichever emergency number is valid for your country. Like other alarms in the application you can set-up email address to send an alarm to.